Chapter 1, Page 6. Transcript below. Panel 2: To the left of the central panel. Alice is miffed. ALICE: “Take the deal.” Hmff. Panel 3: To the right of the central panel. Alice is resigned. ALICE: Well, you’ll probably say yes, Alice. You don’t have Dust Media money. Panel 4: To the left of the central panel. Alice is looking across at Panel 5, holding her thumb and forefinger half an inch apart. Panel 5: Alice looking across at Panel 4, shooting herself finger guns. ALICE: That’s a great idea, Alice. I will do exactly that. 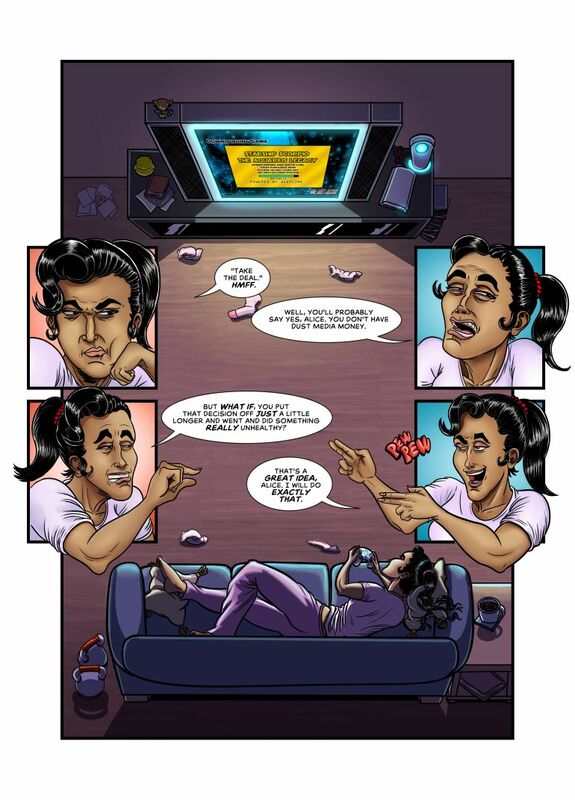 At the bottom of panel 1, at the end of the reader’s sightline, is Alice lying on the couch with a video game controller in hand. Help Brand Echo grow – share this comic and consider becoming a Patreon!